I haven't been doing much knitting during my time off, but I did spend the last couple days birdwatching. 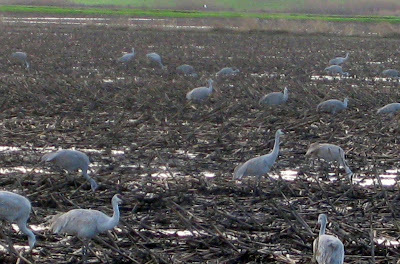 I spent the night in Lodi, something I have wanted to do for several years, to see the Sandhill Cranes that winter there. I'd never seen one before-- they stand three to five feet tall and have a wingspan of up to six feet. These photos are early morning shots of the birds at the ecological preserve where they roost at night. 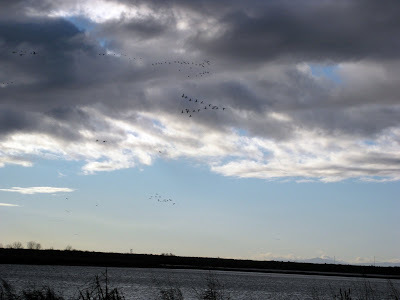 I actually arrived the previous evening just in time to stand in the rain and watch hundreds of cranes fly in. The flocks are so massive that at first I thought I was seeing an approaching helicopter. They are quite vocal and make the oddest sound, almost like a purr. It's hard to see in these pics, but they have a patch of bald red skin on top of their head. I mainly took photos from the comfort of my car because it was COLD there, something I don't often experience. I don't knit a lot of warm wool items because they just aren't needed where I live, but in Lodi I was wishing for a thick warm scarf and hat. Brrrrrr. Fortunately I don't have to return to work until Tuesday, so I have several more days to get out and do more birdwatching. It's a nice way to end the year. Oh how wonderful to see! I'm always thrilled to see cranes and amazed at how big they really are. We have finally felt temps above freezing yesterday....lots of wool here in OH! Love the pics of the cranes. Thanks for sharing!! Happy New Year to you and keep up the great posts. Beautiful! There's a great blue heron who fishes the edge of our cove, and I always make sure to walk by really slowly to catch a glimpse of him. Happy New Year to you Stacy. I am so glad to have "met" you in 2010. Thank you for taking the time to visit and comment on my new blog; it has meant a lot. Bird watching is a great hobby! WOW, looks like wonderful connection with nature! Enjoy your next couple of days off! HUGS! how lovely to see these beautiful birds. 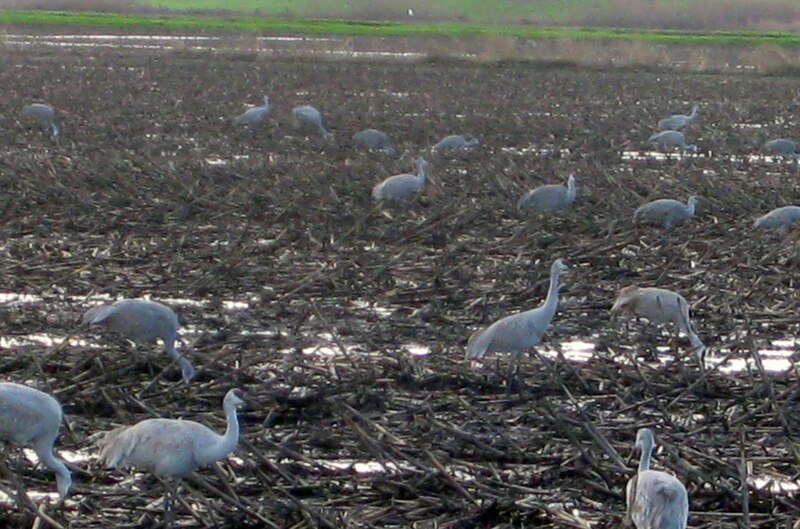 i think there is something particularly special about seeing cranes at the new year. Thanks for all of the new year wishes, everyone. 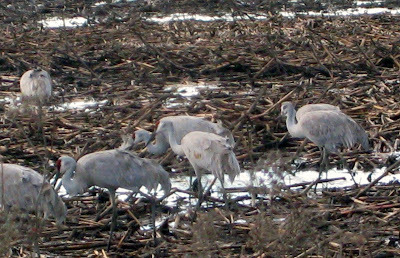 Wow -- your pictures of the cranes remind me of some I took several years ago when I posted about going to see the migration near here. (http://thimbleanna.com/?p=143) I didn't post mine that look like yours, but it's amazing how similar they are. Aren't they fabulous to watch? And thanks for the link you posted -- those photos are just gorgeous!